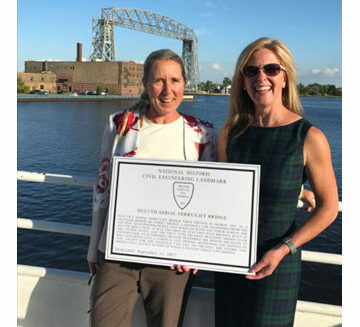 ASCE President-Elect Kristina Swallow helped honor the Duluth Aerial Ferry/Lift Bridge as an ASCE Historic Civil Engineering Landmark. 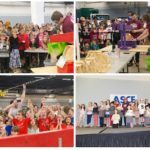 It was a big ASCE week in Duluth, MN. 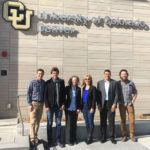 The city hosted the 2017 ASCE Congress on Technical Advancement, Sept. 10-13, drawing civil engineers from around the world. The Duluth Section, meanwhile, celebrated its centennial with a Vista Boat Harbor Cruise, Sept. 11. ASCE President-Elect Kristina Swallow attended to commemorate the anniversary. She also helped recognize the Duluth Aerial Ferry/Lift Bridge, recently elevated to ASCE Historic Civil Engineering Landmark status. The centennial party also provided a unique opportunity to recognize one of ASCE’s most remarkable stories: Robert Rhode, P.E., LS, F.ASCE, a Life Member who remains active in the Duluth Section, still going strong at 103 years old. Learn more about the Duluth Section. Read the entire Duluth News Tribune article. Texas’ infrastructure has received a lot of attention in the past few weeks following Hurricane Harvey. 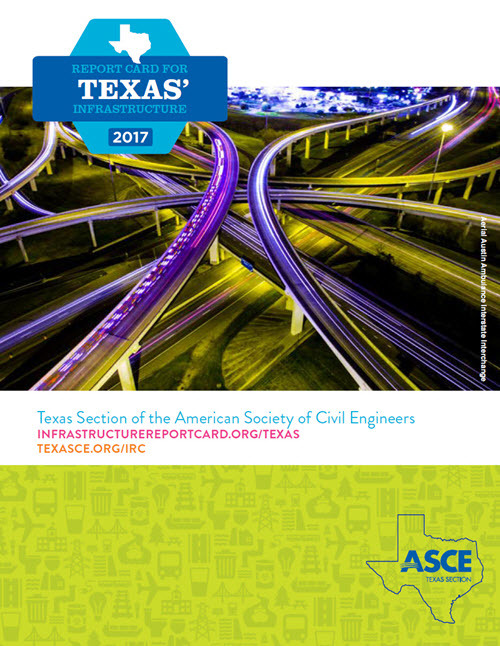 Today, weeks the cities of Port Aransas and Rockport were destroyed and Houston and South Texas flooded, the Texas section of the ASCE released the Report Card for Texas’ Infrastructure, and the report finds there is work to be done and an opportunity to modernize the state’s infrastructure. In the seven categories of infrastructure that were evaluated (including aviation, bridges, dams, highways and roads, flood control, drinking water, and waste water) the highest mark received was a “B” for bridges, followed by aviation with a “B-.” The five remaining categories all received grades in the “D” range including Dams, Drinking Water, Flood Control, Highways and Roads, and Wastewater. Read the entire Report Card. The 2017 GeoMEast International Congress and Exhibition, held in Sharm El-Sheikh, Egypt, brought together over 300 attendees from 48 countries to discuss sustainable civil infrastructure. ASCE President Norma Jean Mattei attended the conference and addressed the attendees. The conference accepted 325 papers that have been published in 15 volumes. GeoMEast 2018 – Sustainable Civil Infrastructure: Structural Integrity is scheduled for Nov. 24-28, 2018, in Cairo, Egypt. The American University of Beirut Student Chapter in Beirut, Lebanon, helped a less fortunate village build a public garden on a scenic cliff overlooking Beirut and the Mediterranean Sea. Follow the AUB students on Facebook, where you can also see a video of the new garden. 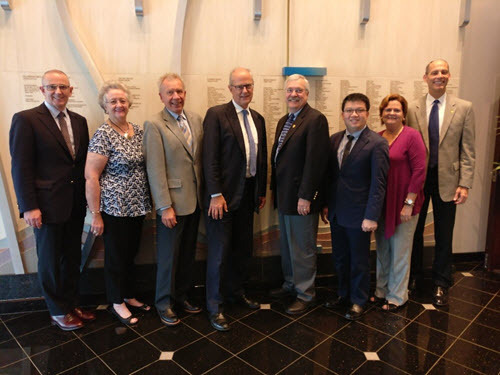 SEI and IStructE leaders recently met at ASCE Headquarters. Leaders from the ASCE Structural Engineering Institute and the Institution of Structural Engineers (IStructE) met at ASCE Headquarters in Reston, VA, to discuss plans for collaboration aligned with SEI global initiatives to enable structural engineers to engage and succeed in global practice. During the meeting, ASCE and IStructE renewed their Agreement of Cooperation for a further 3-year term. Tom Smith, ASCE executive director, joined Ian Firth, IStructE president, and Martin Powell, IStructE chief executive, for a signing ceremony. The San Diego Section hosted an evening celebrating engineering with 200 underserved students in grades 4-12. The Fleet Science Center and local engineering professional societies invited students and parents to see Dream Big, meet with engineering role models, participate in engineering activities, and complete an engineering bingo card for a chance to win prizes. At ASCE’s table, students built a structure using toothpicks and marshmallows and tested it on a shake table made of gelatin. Keep up with the San Diego Section on Facebook. The Minnesota Younger Member Group recently held its fifth annual ASCE BBQ and food drive. 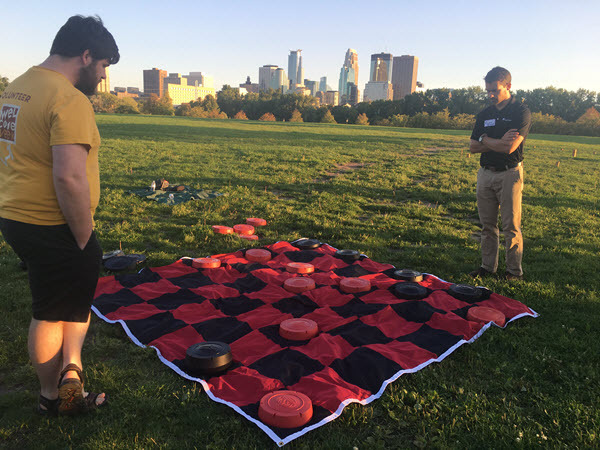 It was another successful event with awesome food, great conversation, and fun yard games – all with a view of the Minneapolis skyline and blue skies. The group raised 59 pounds of food, along with $170 in food-shelf donations. 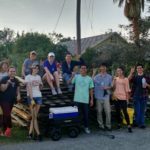 The yard games were all built in-house at previous YMG team-building events and included bags, Connect 4, Kubb, ladder golf, timber toss, giant Jenga, washers, and dice. 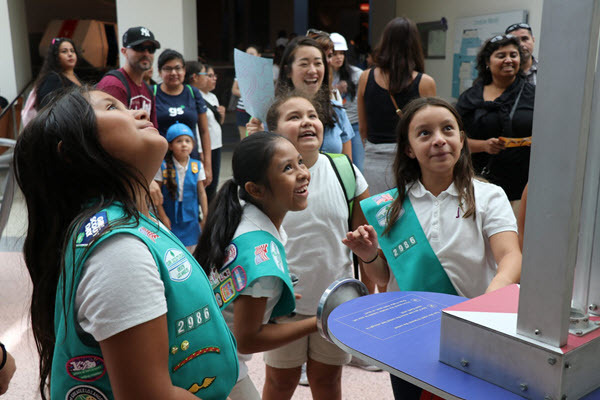 The Los Angeles Younger Member Forum recently partnered with the Girl Scouts of Greater Los Angeles for the “Girl Scouts Dream Big” event at the California Science Center. It was a huge success with more than 350 attendees. The day began with hands-on engineering activities between 12 groups of Girl Scouts matched with a lead female engineer. The 12 groups built bridges, buildings, and pipelines. Some held up and some didn’t when loaded with additional marbles! 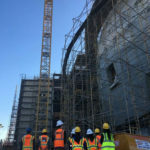 After the hands-on engineering activities, the girl scouts lined up to see the Dream Big 3D IMAX movie, and took advantage of some more photo-ops and selfies. After viewing the film, many of the Girl Scouts were very excited about the possibility of engineering for their future careers! The groups broke for lunch, and then after lunch, the female engineers led their groups throughout the California Science Center’s exhibits and closed the day with the Endeavor Shuttle Exhibit. The day was so much fun and successful, that the ASCE LA YMF and the Girl Scouts of Greater Los Angeles cannot wait to join again for another event! 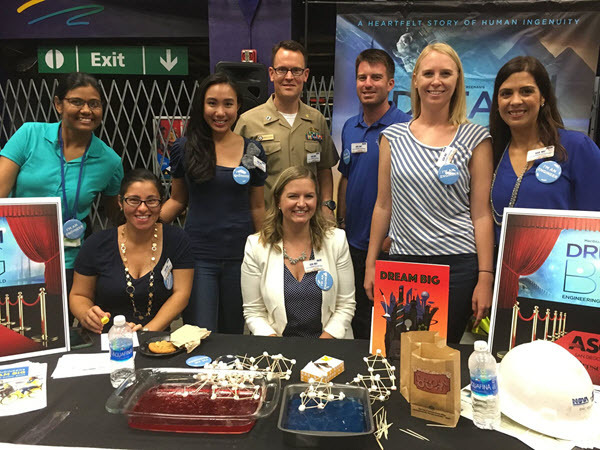 Girl Scouts Dream Big Day was a great day for inspiring future generations of female engineers!